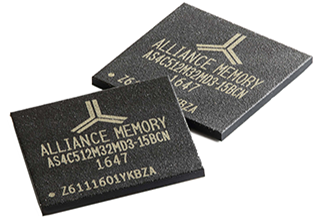 Alliance Memory has introduced a new high-speed CMOS mobile low-power DDR3 (LPDDR3) SDRAM designed to extend battery life in compact portable devices. Featuring low voltage operation of 1.2V/1.8V and a number of power-saving features, our 16Gb AS4C512M32MD3 is offered in the 11.0mm by 11.5mm 178-ball FBGA package. Learn more . 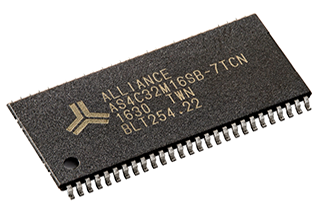 . .
Two new 512Mb synchronous DRAMs (SDRAMs) from Alliance Memory are pin-for-pin replacements for Micron Technology’s discontinued 32M x 16 MT48LC32M16A2P-75:C and MT48LC32M16A2P-75 IT:C SDRAMs, which were acquired by Alliance Memory in 2014. Our AS4C32M16SB-7TCN and AS4C32M16SB-7TIN are available in commercial (0°C to +70°C) and industrial (-40°C to +85°C) temperature ranges. Learn more . . .
We’ve expanded our manufacturers’ representative agreement with ISMOSYS, the principal trading division of the Spectrum Electronics Group. Having offered Alliance Memory’s entire lineup of SRAMs and DRAMs in Italy since 2006, ISMOSYS is now the exclusive representative for our memory solutions to direct OEMs and distributor channels in Spain, Portugal, and Turkey. Learn more . . . Recently one of our team members shared with me a list of the top 20 electronics distributors worldwide. As I scanned the list, it brought home to me how much Alliance Memory has achieved in our first decade in business, including attracting the top worldwide, as well as regional, distributors. Not only does this make us proud of what we’ve accomplished, it is also a reminder of how much our channel partners have contributed to our growth. Our network of franchised distributors ensures that customers anywhere in the world can quickly and easily obtain the hard-to-find memory ICs that many end customers need literally to stay in business. We are grateful to have them as essential partners in our goal to be a trusted resource for a global community of manufacturers.